In addition to everything this beautiful city has to offer, Dorchester Collection’s exquisite properties are just as much of a destination as Paris itself. Le Meurice and Hôtel Plaza Athénée showcase French history and culture, creating an unforgettable experience from the moment you arrive. Plus, Cadence holds elite status with The Dorchester Collection, which means an elevated experience for you from start to finish. In addition, check out the other amazing Diamond Club offers you have access to! Paris is the perfect destination for families with children of any age. With so many parks, museums, and neighborhoods to explore, you’ll need as much time as possible to explore this beautiful city. Enjoy 50% off a second nearby or connecting room for children, daily breakfast, and welcome gifts for both parents and children. Valid for a minimum two-night stay before December 31, 2019, subject to availability. 50% discount on children’s room applies to Deluxe Room. The second room at 50% off will not get the guaranteed next tier upgrade or 100 Euros off. When you book a suite for three nights or more, arrive in style with a complimentary luxury chauffeured transfer from the airport or train station to the hotel. Valid for a minimum three-night stay before December 31, 2019. Applies to Superior Suite, Deluxe Suite, Avenue Montaigne Deluxe Suite, Executive Suite, Prestige Suite and Presidential Suite. Includes all Diamond Club amenities. When you’re living in the lap of luxury, it’s hard to leave. That’s why when you book a room or suite for four or more consecutive nights, the fourth night is complimentary. Valid for a minimum four-night stay before May 20, and between July 14 and September 5, 2019, subject to availability. Includes all Diamond Club amenities. ﻿In this exclusive Hôtel Plaza Athénée offer, shutterbugs and those celebrating a special occasion will love the chance to have a photoshoot around the hotel and throughout Paris in search of the perfect backdrop while creating memories along the way. A professional photographer will take you to all the best spots around the city and give you exclusive access to private areas of the hotel during the 3-hour private photoshoot. Capture all your Paris memories in these beautiful shots. Valid for a two-night minimum stay, before December 31, 2019, subject to availability. Offer applies to all room and suite types, excluding Classic Single Room. Now for the hard part - which property will you choose? Or perhaps you will combine them for the ultimate stay! Opposite the scenic Tuileries Garden and next to eye catching landmarks, you’ll find Le Meurice nestled into a classically French exterior. At the gilded entrance, doormen outfitted in top hats and coat tails usher you into a lobby so grand you’ll wonder if you’re in a movie—and that’s just the beginning. 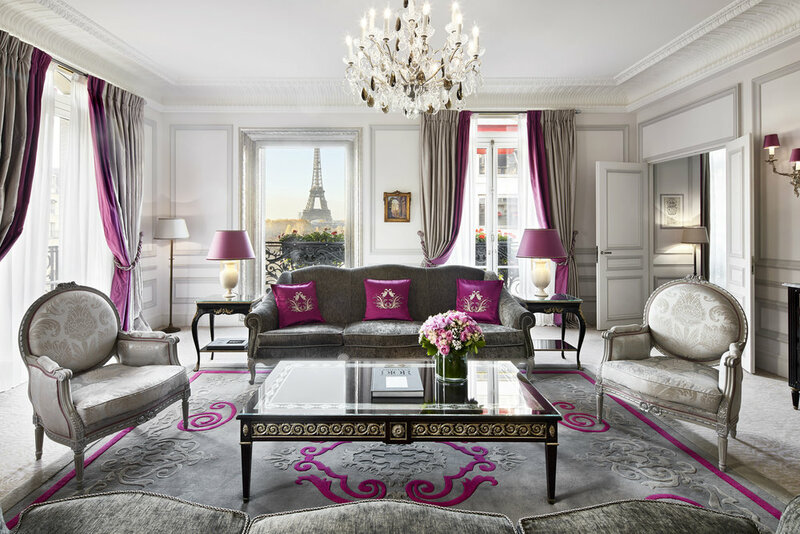 A living work of art and the epitome of French elegance, Le Meurice masterfully combines 18th-century splendor with the most innovative modern comforts. Explore shops and restaurants along Rue de Rivoli, wander cobblestone streets, and live like kings and queens at this iconic Paris hotel. Situated on the prestigious Avenue Montaigne, you can’t miss this stunning property, easily identified by the iconic red window coverings. See and be seen at this destination hotel known to attract international dignitaries, celebrities, and the chicest of locals. Discover the culinary mastery of Alain Ducasse with a three Michelin-starred dining experience or treat yourself to a luxury spa day at Europe’s only Dior Institut spa. Rub shoulders with the Paris elite on tree-lined streets after a day of shopping or an evening apéro before retiring to your boudoir for some much repose.